Amadeo I (Italian: Amedeo, sometimes anglicized as Amadeus; 30 May 1845 – 18 January 1890), was an Italian prince who reigned as King of Spain from 1870 to 1873. The only King of Spain from the House of Savoy, he was the second son of King Vittorio Emanuele II of Italy and was known for most of his life as the Duke of Aosta, but was appointed King of Spain briefly, from 1870 to 1873. He was elected by the Cortes as Spain's monarch in 1870, following the deposition of Isabella II, and was sworn in the following year. Amadeo's reign was fraught with growing republicanism, Carlist rebellions in the north, and the Cuban independence movement. He abdicated and returned to Italy in 1873, and the First Spanish Republic was declared as a result. Granted the hereditary title of Duke of Aosta in the year of his birth, he founded the Aosta branch of Italy's royal House of Savoy, which is junior in agnatic descent to the branch descended from King Umberto I that reigned in Italy until 1900, but senior to the branch of the Dukes of Genoa. Prince Amedeo of Savoy was born in Turin (then part of the Kingdom of Sardinia). He was the second son of King Vittorio Emanuele II (King of Piedmont, Savoy, Sardinia and, later, first King of Italy) and of Archduchess Adelaide of Austria. He was styled the Duke of Aosta from birth. Entering the army as captain in 1859 he fought through the Third Italian War of Independence in 1866 with the rank of major-general, leading his brigade into action at the Battle of Custoza and being wounded at Monte Torre. In 1868, after his marriage, he was created vice admiral of the Italian navy, but this position ended when he ascended the Spanish throne. 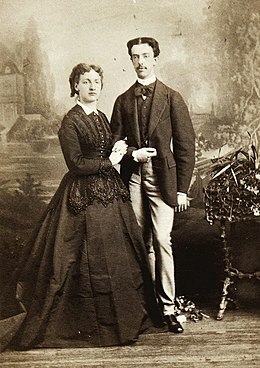 In 1867 his father yielded to the entreaties of parliamentary deputy Francisco Cassins, and on 30 May of that year, Amedeo was married to Donna Maria Vittoria dal Pozzo. The King initially opposed the match on the grounds that her family was of insufficient rank, as well as his hopes for his son's marriage to a German princess. Despite her princely title, Donna Maria Vittoria was not of royal birth, belonging rather to the Piedmontese nobility. She was, however, the sole heir of her father's vast fortune, which subsequent Dukes of Aosta inherited, thereby obtaining wealth independent of their dynastic appanage and allowances from Italy's kings. The wedding day of Prince Amedeo and Donna Maria Vittoria was marred by the death of a stationmaster who was crushed under the wheels of the honeymoon train. In March 1870, the Duchess appealed to the King to remonstrate with his son for marital infidelities that caused her hurt and embarrassment. But the King wrote in reply that, while understanding her feelings, he considered that she had no right to dictate her husband's behaviour and that her jealousy was unbecoming. Amadeo as King of Spain on a coin from 1871. After the Spanish revolution deposed Isabella II, the new Cortes decided to reinstate the monarchy under a new dynasty. The Duke of Aosta was elected King as Amadeus (Amadeo) on 16 November 1870. He swore to uphold the constitution in Madrid on 2 January 1871. The election of the new King coincided with the assassination of General Prim, his main backer. After that, Amadeo had to deal with difficult situations, with unstable Spanish politics, republican conspiracies, Carlist uprisings, separatism in Cuba, same-party disputes, fugitive governments and assassination attempts. He could count on the support of only the progressive party, whose leaders were trading off in the government thanks to parliamentary majority and electoral fraud. The progressives divided into monarchists and constitutionalists, which made the instability worse, and in 1872 a violent outburst of interparty conflicts hit a peak. There was a Carlist uprising in the Basque and Catalan regions, and after that, republican uprisings happened in cities across the country. The artillery corps of the army went on strike, and the government instructed the King to discipline them. Though warned of a plot against his life on 18 August 1872, he refused to take precautions, and, while returning from Buen Retiro Park to Madrid in company with the queen, was repeatedly shot at in Via Avenal. The royal carriage was struck by several revolver and rifle bullets, the horses wounded, but its occupants escaped unhurt. A period of calm followed the event. With the possibility of reigning without popular support, Amadeus issued an order against the artillery corps and then immediately abdicated from the Spanish throne on 11 February 1873. At ten o'clock that same night, Spain was proclaimed a republic, at which time Amadeo made an appearance before the Cortes, proclaiming the Spanish people ungovernable. 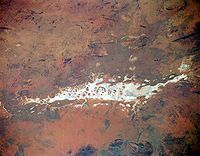 Lake Amadeus in Australia's Northern Territory was named in honour of Amadeo. Completely disgusted, the ex-monarch left Spain and returned to Italy, where he resumed the title of Duke of Aosta. The First Spanish Republic lasted less than two years, and in November 1874 Alfonso XII, the son of Isabella II, was proclaimed king, with Antonio Cánovas del Castillo, Spanish intermittent prime minister from 1873 until his assassination in 1897, briefly serving as regent. After the death of his first wife, Amadeo married his French niece, Princess Maria Letizia Bonaparte (20 November 1866 – 25 October 1926), daughter of his sister Maria Clotilde and of Napoléon Joseph Charles Paul Bonaparte, a nephew of Napoleon I. They had one child, Umberto (1889–1918), who died of the flu during the First World War. 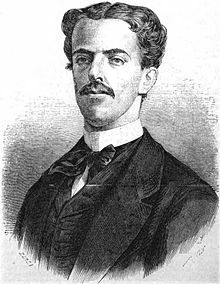 Amadeo remained in Turin, Italy until his death on 18 January 1890, less than two years after marrying his second wife. His friend Puccini composed the famous elegy for string quartet Crisantemi in his memory. Lake Amadeus in central Australia is named after him, as is the Philippine municipality of Amadeo, Cavite. Prince Emanuele Filiberto, Duke of Aosta (13 January 1869 – 4 July 1931) Marshal of Italy married to Princess Hélène of Orléans and had issue. Prince Vittorio Emanuele, Count of Turin (24 November 1870 – 10 October 1946) died unmarried. Prince Luigi Amedeo, Duke of the Abruzzi (29 January 1873 – 18 March 1933) Vice Admiral in the Italian Royal Navy died unmarried. Umberto, Count of Salemi (22 June 1889 – 19 October 1918), died in World War I. His Majesty Amadeo the First, By the Grace of God and Will of the Nation, King of Spain, Duke of Aosta. Steed, H. Wickham (1911). "Amedeo Ferdinando Maria di Savoia" . In Chisholm, Hugh (ed.). Encyclopædia Britannica. 1 (11th ed.). Cambridge University Press. p. 804. ^ a b c d Pollock, Sabrina (August 2006). "Spain's Forgotten Queen". European Royal History Journal. 9.4 (LII): 25–26. ^ "Savoia Amedeo Ferdinando Duca D'Aosta" (in Italian), Il sito ufficiale della Presidenza della Repubblica. Retrieved 2018-08-13. Wikimedia Commons has media related to Amadeo I of Spain.